AD-Series AUTODISCONNECT SPRING CLUTCHES - Tiny Clutch | Helander Products, Inc. The AD-Series Tiny-Clutches combine the high torque capacity of a spring clutch with a bidirectional free wheeling output. These clutches are suited for use in applications such as, coil winding, spool winding, film drives or any similar application requiring an automatically free wheeling clutch. When torque is applied to the input it forces the spring to wrap down on the output drum. In this condition the clutch will drive. When torque is removed from the input, the spring is free to relax and unwind, thus decoupling the input from the output automatically, leaving the output free to rotate in both directions. 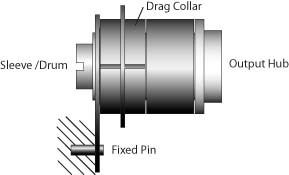 The sleeve is screwed, pinned or keyed to your shaft & clutch may be driven through either the sleeve or the hub. AD-Series Tiny-Clutches are available for Shafts up to 11/8" & torque loads up to 350lbs-in | 39.5Nm . Special input or output hubs are available upon request to suit customers' needs. We will design & build special or modified clutches for your application using stock components. Clutches can be supplied with gears, sprockets, pullies or as complete mechanical assemblies consisting of clutch, shaft and adjacent parts. 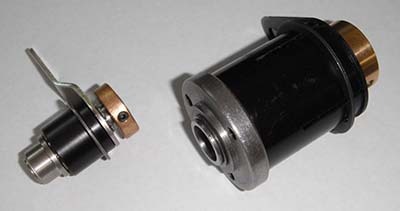 The AD-Series clutches should be mounted so that a stationary pin engages the slot in the torque arm. It is important that the torque arm is not firmly screwed down but allowed to float, as this may prevent the clutch from operating normally.